Separate men's & women's championship although no restrictions on women competing against men. Mountain biking is a sport of riding bicycles off-road, often over rough terrain, using specially designed mountain bikes. Mountain bikes share similarities with other bikes but incorporate features designed to enhance durability and performance in rough terrain. Mountain biking can generally be broken down into multiple categories: cross country, trail riding, all mountain (also referred to as "Enduro"), downhill, freeride and dirt jumping. This sport requires endurance, core strength and balance, bike handling skills, and self-reliance. Advanced riders pursue both steep technical descents and high incline climbs. In the case of freeride, downhill, and dirt jumping, aerial maneuvers are performed off both natural features and specially constructed jumps and ramps. Mountain bikers ride on off-road trails such as singletrack, back-country roads, fire roads, and often venture to ski resorts that stay open in the summer for such activities. Because riders are often far from civilization, there is a strong ethic of self-reliance in the sport. Riders learn to repair broken bikes and flat tires to avoid being stranded. Many riders carry a backpack, including water, food, tools for trailside repairs, and a first aid kit in case of injury. Group rides are common, especially on longer treks. Mountain bike orienteering adds the skill of map navigation to mountain biking. 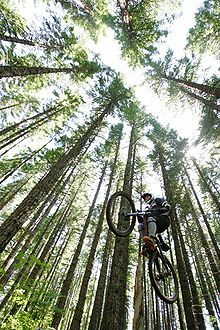 Mountain biker gets air in Mount Hood National Forest. Bicycles were ridden off-road by road racing cyclists who used cyclocross as a means of keeping fit during the winter. Cyclo-cross eventually became a sport in its own right in the 1940s, with the first world championship taking place in 1950. The Rough Stuff Fellowship was established in 1955 by off-road cyclists in the United Kingdom. In Oregon, one Chemeketan club member, D. Gwynn, built a rough terrain trail bicycle in 1966. He named it a "mountain bicycle" for its intended place of use. This may be the first use of that name. In England in 1968, Geoff Apps, a motorbike trials rider, began experimenting with off-road bicycle designs. By 1979 he had developed a custom-built lightweight bicycle which was uniquely suited to the wet and muddy off-road conditions found in the south-east of England. They were designed around 2 inch x 650b Nokian snow tires though a 700x47c (28 in.) version was also produced. These were sold under the Cleland Cycles brand until late 1984. Bikes based on the Cleland design were also sold by English Cycles and Highpath Engineering until the early 1990s. There were several groups of riders in different areas of the U.S.A. who can make valid claims to playing a part in the birth of the sport. Riders in Crested Butte, Colorado, and Cupertino, California, tinkered with bikes and adapted them to the rigors of off-road riding. Modified heavy cruiser bicycles, old 1930s and '40s Schwinn bicycles retrofitted with better brakes and fat tires, were used for freewheeling down mountain trails in Marin County, California, in the mid-to-late 1970s. At the time, there were no mountain bikes. The earliest ancestors of modern mountain bikes were based around frames from cruiser bicycles such as those made by Schwinn. The Schwinn Excelsior was the frame of choice due to its geometry. Riders used balloon-tired cruisers and modified them with gears and motocross or BMX-style handlebars, creating "klunkers". The term would also be used as a verb since the term "mountain biking" was not yet in use. Riders would race down mountain fireroads, causing the hub brake to burn the grease inside, requiring the riders to repack the bearings. These were called "Repack Races" and triggered the first innovations in mountain bike technology as well as the initial interest of the public (on Mt. Tamalpais in Marin CA, there is still a trail titled "Repack"—in reference to these early competitions). The sport originated in California on Marin County's Mount Tamalpais. It was not until the late 1970s and early 1980s that road bicycle companies started to manufacture mountain bicycles using high-tech lightweight materials. Joe Breeze is normally credited with introducing the first purpose-built mountain bike in 1978. Tom Ritchey then went on to make frames for a company called MountainBikes, a partnership between Gary Fisher, Charlie Kelly, John Frey (Marin County mountain biking innovator) and Tom Ritchey. Tom Ritchey, a welder with skills in frame building, also built the original bikes. The company's three partners eventually dissolved their partnership, and the company became Fisher Mountain Bikes, while Tom Ritchey started his own frame shop. The first mountain bikes were basically road bicycle frames (with heavier tubing and different geometry) with a wider frame and fork to allow for a wider tire. The handlebars were also different in that they were a straight, transverse-mounted handlebar, rather than the dropped, curved handlebars that are typically installed on road racing bicycles. Also, some of the parts on early production mountain bicycles were taken from the BMX bicycle. Other contributors were Otis Guy and Keith Bontrager. Tom Ritchey built the first regularly available mountain bike frame, which was accessorized by Gary Fisher and Charlie Kelly and sold by their company called MountainBikes (later changed to Fisher Mountain Bikes, then bought by Trek, still under the name Gary Fisher, currently sold as Trek's "Gary Fisher Collection"). The first two mass-produced mountain bikes were sold in the early 1980s: the Specialized Stumpjumper and Univega Alpina Pro. In 1988, The Great Mountain Biking Video was released, soon followed by others. In 2007, Klunkerz: A Film About Mountain Bikes was released, documenting mountain bike history during the formative period in Northern California. Additionally, a group of mountain bikers called the Laguna Rads formed a club during the mid eighties and began a weekly ride, exploring the uncharted coastal hillsides of Laguna Beach, California. Industry insiders suggest that this was the birth of the freeride movement, as they were cycling up and down hills and mountains where no cycling specific trail network prexisted. The Laguna Rads have also held the longest running dowhill race once a year since 1986. At the time, the bicycle industry was not impressed with the mountain bike, regarding mountain biking to be short-term fad. In particular, large manufacturers such as Schwinn and Fuji failed to see the significance of an all-terrain bicycle and the coming boom in 'adventure sports'. Instead, the first mass-produced mountain bikes were pioneered by new companies such as MountainBikes (later, Fisher Mountain Bikes), Ritchey, and Specialized. Specialized was an American startup company that arranged for production of mountain bike frames from factories in Japan and Taiwan. First marketed in 1981, Specialized's mountain bike largely followed Tom Ritchey's frame geometry, but used TiG welding to join the frame tubes instead of fillet-brazing, a process better suited to mass production, and which helped to reduce labor and manufacturing cost. The bikes were configured with 15 gears using derailleurs, a triple chainring, and a cogset with five sprockets. Throughout the 1990s and first decade of the 21st century, mountain biking moved from a little-known sport to a mainstream activity. Mountain bikes and mountain bike gear, once only available at specialty shops or via mail order, became available at standard bike stores. By the mid-first decade of the 21st century, even some department stores began selling inexpensive mountain bikes with full-suspension and disc brakes. In the first decade of the 21st century, trends in mountain bikes included the "all-mountain bike", the 29er and the one by drive train. "All-mountain bikes" were designed to descend and handle well in rough conditions, while still pedalling efficiently for climbing, and were intended to bridge the gap between cross-country bikes and those built specifically for downhill riding. They are characterized by 4–6 inches (100–150 millimetres) of fork travel. 29er bikes are those using 700c sized rims (as do most road bikes), but wider and suited for tires of two inches (50mm) width or more; the increased diameter wheel is able to roll over obstacles better and offers a greater tire contact patch, but also results in a longer wheelbase, making the bike less agile, and in less travel space for the suspension. The single-speed is considered a return to simplicity with no drivetrain components or shifters but thus requires a stronger rider. Following the growing trend in 29-inch wheels, there have been other trends in the mountain biking community involving tire size. One of the more prevalent is the new, somewhat esoteric and exotic 650B (27.5 inch) wheelsize, based on the obscure wheel size for touring road bikes. Another interesting trend in mountain bikes is outfitting dirt jump or urban bikes with rigid forks. These bikes normally use 4–5" travel suspension forks. The resulting product is used for the same purposes as the original bike. A commonly cited reason for making the change to a rigid fork is the enhancement of the rider's ability to transmit force to the ground, which is important for performing tricks. In the mid-first decade of the 21st century, an increasing number of mountain bike-oriented resorts opened. Often, they are similar to or in the same complex as a ski resort or they retrofit the concrete steps and platforms of an abandoned factory as an obstacle course, as with Ray's MTB Indoor Park. Mountain bike parks which are operated as summer season activities at ski hills usually include chairlifts that are adapted to bikes, a number of trails of varying difficulty, and bicycle rental facilities. Mountain bikes differ from other bikes primarily in that they incorporate features aimed at increasing durability and improving performance in rough terrain. Most modern mountain bikes have some kind of suspension, 26, 27.5 or 29 inch diameter tires, usually between 1.7 and 2.5 inches in width, and a wider, flat or upwardly-rising handlebar that allows a more upright riding position, giving the rider more control. They have a smaller, reinforced frame, usually made of wide tubing. Tires usually have a pronounced tread, and are mounted on rims which are stronger than those used on most non-mountain bicycles. Compared to other bikes, mountain bikes also tend to more frequently use hydraulic disc brakes. They also tend to have lower ratio gears to facilitate climbing steep hills and traversing obstacles. Pedals vary from simple platform pedals, where the rider simply places the shoes on top of the pedals, to clipless, where the rider uses a specially equipped shoe with a cleat that engages mechanically into the pedal. Glasses with little or no difference from those used in other cycling sports, help protect against debris while on the trail. Filtered lenses, whether yellow for cloudy days or shaded for sunny days, protect the eyes from strain. Downhill, freeride, and enduro mountain bikers often use goggles similar to motocross or snowboard goggles in unison with their full face helmets. Shoes generally have gripping soles similar to those of hiking boots for scrambling over un-ridable obstacles, unlike the smooth-bottomed shoes used in road cycling. The shank of mountain bike shoes is generally more flexible than road cycling shoes. Shoes compatible with clipless pedal systems are also frequently used. Clothing is chosen for comfort during physical exertion in the backcountry, and its ability to withstand falls. Road touring clothes are often inappropriate due to their delicate fabrics and construction. Depending on the type of mountain biking, different types of clothes and styles are commonly worn. Cross-country mountain bikers tend to wear lycra shorts and tight road style jerseys due to the need for comfort and efficiency. 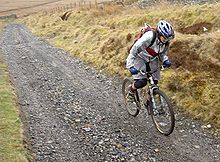 Downhill riders tend to wear heavier fabric baggy shorts or moto-cross style trousers in order to protect themselves from falls. All mountain/enduro riders tend to wear light fabric baggy shorts and jerseys as they can be in the saddle for long periods of time. Hydration systems are important for mountain bikers in the backcountry, ranging from simple water bottles to water bags with drinking tubes in lightweight backpacks (e.g., Camelbaks). GPS systems are sometimes added to the handlebars and are used to monitor progress on trails. CO2 Inflator with Cartridge to inflate a tube or tubeless tire. Bike tools and extra bike tubes are important, as mountain bikers frequently find themselves miles from help, with flat tires or other mechanical problems that must be handled by the rider. High-power lights based on LED technology, used for mountain biking at night. The level of protection worn by individual riders varies greatly and is affected by speed, trail conditions, the weather, experience, fitness, desired style and numerous other factors, including personal choice. Protection becomes more important where these factors may be considered to increase the possibility or severity of a crash. A helmet and gloves are usually regarded as sufficient for the majority of non-technical riding. Full-face helmets, goggles and armored suits or jackets are frequently used in downhill mountain biking, where the extra bulk and weight may help mitigate the risks of bigger and more frequent crashes. Helmets provide important head protection. The use of helmets, in one form or another, is almost universal amongst all mountain bikers. The main three types are cross-country, rounded skateboarder style (nicknamed "half shells" or "skate style") and full-face. Cross-country helmets tend to be light and well ventilated, and more comfortable to wear for long periods, especially while perspiring in hot weather. In XC competitions, most bikers use the usual road-racing style helmets, for their lightweight and aerodynamic qualities. Skateboard helmets are simpler and cheaper than other helmet types; provide greater coverage of the head and resist minor scrapes and knocks. Unlike road-biking helmets, skateboard helmets typically have a thicker, hard plastic shell which can take multiple impact before it needs to be replaced. The trade-off for this is that they tend to be much heavier and less ventilated (sweatier), therefore not suitable for endurance-based riding. Full-face helmets (BMX-style) provide the highest level of protection, being stronger again than skateboard style and including a jaw guard to protect the face. The weight is the main issue with this type, but today they are often reasonably well-ventilated and made of lightweight materials such as carbon fiber. (Full-face helmets with detachable chin-guards are available in some locations, but there are compromises to keep in mind with these designs.) As all helmets should meet minimum standards, SNELL B.95 (American Standard) BS EN 1078:1997 (European Standard), DOT or "motorized ratings" are making their way into the market. The choice of helmet often comes down to rider preference, likelihood of crashing, and on what features or properties of a helmet they place emphasis. Helmets are mandatory at competitive events and almost without exception at bike parks, most organisations also stipulate when and where full-face helmets must be used. Body armor and pads, often referred to simply as "armor", protect limbs and trunk in the event of a crash. While initially made for and marketed at downhillers, freeriders and jump/street riders, body armor has trickled into other areas of mountain biking as trails have become steeper and more technically complex (hence bringing a commensurately higher injury risk). Armor ranges from simple neoprene sleeves for knees and elbows to complex, articulated combinations of hard plastic shells and padding that cover a whole limb or the entire body. Some companies market body armor jackets and even full-body suits designed to provide greater protection through greater coverage of the body and more secure pad retention. Most upper-body protectors also include a spine protector that comprises plastic or metal reinforced plastic plates, over foam padding, which are joined together so that they articulate and move with the back. Some mountain bikers also use BMX-style body armor, such as chest plates, abdomen protectors, and spine plates. New technology has seen an influx of integrated neck protectors that fit securely with full-face helmets, such as the Leatt-Brace. There is a general correlation between increased protection and increased weight/decreased mobility, although different styles balance these factors differently. Different levels of protection are deemed necessary/desirable by different riders in different circumstances. Backpack hydration systems such as Camelbaks, where a water-filled bladder is held close to the spine, are used by some riders for their perceived protective value. More recently, with the increase in enduro racing, backpack hydration systems are also being sold with inbuilt spine protection. However, there is only anecdotal evidence of protection. Gloves can offer increased comfort while riding, by alleviating compression and friction, and can protect against superficial hand injuries. They provide protection in the event of strikes to the back or palm of the hand or when putting the hand out in a fall and can protect the hand, fingers, and knuckles from abrasion on rough surfaces. Many different styles of gloves exist, with various fits, sizes, finger lengths, palm padding and armor options available. Armoring knuckles and the backs of hands with plastic panels is common in more extreme types of mountain biking. First aid kits are often carried by mountain bikers, so that they are able to clean and dress cuts and abrasions and splint broken limbs. Head, brain, and spinal injuries become more likely as speeds increase. All of these can bring permanent changes in quality of life. Experienced mountain bike guides may be trained in dealing with suspected spinal injuries (e.g., immobilizing the victim and keeping the neck straight). Seriously injured people may need to be removed by stretcher, by a motor vehicle suitable for the terrain, or by helicopter. Protective gear cannot provide immunity against injuries. For example, concussions can still occur despite the use of helmets, and spinal injuries can still occur with the use of spinal padding and neck braces. The use of high-tech protective gear can result in a revenge effect, whereupon some cyclists feel safe taking dangerous risks. Because the key determinant of injury risk is kinetic energy, and because kinetic energy increases with the square of speed, effectively each doubling of speed quadruples the injury risk. Higher speeds of travel also add danger due to reaction time. Because higher speeds mean that the rider travels further during his/her reaction time, this leaves less travel distance within which to react safely. This, in turn, further multiplies the risk of an injurious crash. Cross-Country (XC) generally means riding point-to-point or in a loop including climbs and descents on a variety of terrain. A typical XC bike weighs around 9-13 kilos (20-30 lbs), and has 0–125 millimeters (0.0–4.9 inches) of suspension travel front and sometimes rear. Cross country mountain biking focuses on physical strength and endurance more than the other forms, which require greater technical skill. Cross country mountain biking is the only mountain biking discipline in the Summer Olympic Games. All-mountain/Enduro uses bikes with a moderate-travel suspension systems and components that are usually stronger than XC models, but a weight still suitable for climbing and descending. While traditionally called All-mountain riding, this style has been adopted to the Enduro World Series. There are two formats of Enduro racing. "Big-Mountain" Enduro is similar to a DH course, but is much longer, sometimes taking a full day to complete and often incorporates climbing sections. "Gravity" enduro uses roughly equal amounts uphill and downhill, but the uphill segments are not timed. Typically, there is a maximum time limit on how long a rider has to reach the top of the climb. There is also a third category called "super-D" which is similar to XC, but has sustained climbs followed by sustained descents, with the climbs less technical than the descents. Enduro racing is seen as the "everyman's" race in North America, and while there are still extremely high level riders such as Jérôme Clémentz that race enduro full-time, most enduro racers compete for fun. Downhill (DH) is, in the most general sense, riding mountain bikes downhill. Courses include large jumps (up to and including 12 meters (39 feet)), drops of 3+ meters (10+ feet), and are generally rough and steep from top to bottom. The rider commonly travels to the point of descent by other means than cycling, such as a ski lift or automobile, as the weight of the downhill mountain bike often precludes any serious climbing. Downhill racers must possess a unique combination of total body strength, aerobic and anaerobic fitness, mental control, as well as the acceptance of a relatively high risk of incurring serious injury. Because of their extremely steep terrain (often located in summer at ski resorts), downhill is one of the most extreme and dangerous cycling disciplines. Minimum body protection in a true downhill setting entails wearing knee pads and a full-face helmet with goggles, albeit riders and racers commonly wear full-body suits that include padding at various locations. Downhill-specific bikes are universally equipped with front and rear suspension, large disc brakes, and use heavier frame tubing than other mountain bikes. Downhill bicycles now weigh around 16–20 kg (35–44 lb), while the most expensive professional downhill mountain bikes can weigh as little as 15 kilograms (33 pounds), fully equipped with custom carbon fiber parts, air suspension, tubeless tires and more. Downhill frames have anywhere from 170–250 millimeters (6.7–9.8 inches) of travel and are usually equipped with a 200 millimeters (7.9 inches) travel dual-crown fork. Four-cross/Dual Slalom (4X) is a discipline in which riders compete either on separate tracks, as in Dual Slalom, or on a short slalom track, as in 4X. Most bikes used are light hard-tails, although the last World Cup was actually won on a full suspension bike. The tracks have dirt jumps, berms, and gaps. Professionals in gravity mountain biking tend to concentrate either on downhill mountain biking or 4X/dual slalom because they are very different. However, some riders, such as Cedric Gracia, still do 4X and DH, although that is becoming more rare as 4X takes on its own identity. Freeride / Big Hit / Hucking, as the name suggests, is a 'do anything' discipline that encompasses everything from downhill racing without the clock to jumping, riding 'North Shore' style (elevated trails made of interconnecting bridges and logs), and generally riding trails and/or stunts that require more skill and aggressive techniques than XC. "Slopestyle" type riding is an increasingly popular genre that combines big-air, stunt-ridden freeride with BMX style tricks. Slopestyle courses are usually constructed at already established mountain bike parks and include jumps, large drops, quarter-pipes, and other wooden obstacles. There are always multiple lines through a course and riders compete for judges' points by choosing lines that highlight their particular skills. A "typical" freeride bike is hard to define, but typical specifications are 13-18 kilos (30-40 lbs) with 150–250 millimeters (5.9–9.8 inches) of suspension front and rear. Freeride bikes are generally heavier and more amply suspended than their XC counterparts, but usually retain much of their climbing ability. It is up to the rider to build his or her bike to lean more toward a preferred level of aggressiveness. Dirt Jumping (DJ) is the practice of riding bikes over shaped mounds of dirt or soil and becoming airborne. The goal is that after riding over the 'take off' the rider will become airborne, and aim to land on the 'landing'. Dirt jumping can be done on almost any bicycle, but the bikes chosen are generally smaller and more maneuverable hardtails so that tricks e.g. backflips, are easier to complete. The bikes are simpler so that when a crash occurs there are fewer components to break or cause the rider injury. Bikes are typically built from sturdier materials such as steel to handle repeated heavy impacts of crashes and bails. Trials riding consists of hopping and jumping bikes over obstacles, without touching a foot onto the ground. It can be performed either off-road or in an urban environment. This requires an excellent sense of balance. The emphasis is placed on techniques of effectively overcoming the obstacles, although street-trials (as opposed to competition-oriented trials) is much like Street and DJ, where doing tricks with style is the essence. Trials bikes look almost nothing like mountain bikes. They use either 20", 24" or 26" wheels and have very small, low frames, some types without a saddle. Urban/Street is essentially the same as urban BMX (or Freestyle BMX), in which riders perform tricks by riding on/over man made objects. The bikes are the same as those used for Dirt Jumping, having 24" or 26" wheels. Also, they are very light, many in the range of 25–30 lb (11–14 kg), and are typically hardtails with between 0-100 millimeters of front suspension. As with Dirt Jumping and Trials, style and execution are emphasized. Trail riding or trail biking is recreational mountain biking on recognised, and often waymarked, trails; unpaved tracks, forest paths, etc. Trails may take the form of single routes or part of a larger complexes, known as trail centres. There are "trail bike" designs for this activity. Mountain Bike Touring or Marathon is long-distance touring on dirt roads and single track with a mountain bike. With the popularity of the Great Divide Trail, the Colorado Trail and other long-distance off-road biking trails, specially outfitted mountain bikes are increasingly being used for touring. Bike manufacturers like Salsa have even developed MTB touring bikes like the Fargo model. Mixed Terrain Cycle-Touring or rough riding is a form of mountain-bike touring but involves cycling over a variety of surfaces and topography on a single route, with a single bicycle that is expected to be satisfactory for all segments. The recent surge in popularity of mixed-terrain touring is in part a reaction against the increasing specialization of the bicycle industry. Mixed-terrain bicycle travel has a storied history of focusing on efficiency, cost-effectiveness, and freedom of travel over varied surfaces. Bikepacking is a self-supported style of lightly-loaded single or multiple night mountain biking. Bikepacking is similar to bike touring, however the two sports generally use different bikes and the main difference is the method of carrying gear. Bikepacking generally involves carrying less gear and using smaller frame bags while bike touring will use panniers. A typical bikepacking set-up includes a frame bag, handlebar roll, seat pack and backpack and typical gear includes lightweight and basic camping gear, and a bike repair kit. Mountain bikes are generally used as many bike packing destinations are reached via forest-service roads or singletrack trails. Mountain bikes specific to bike-packing use a slightly taller frame to get the maximum framebag capacity. This is achieved by using a longer headtube, a more horizontal top tube and a reduced stem degree. Generally, bikepackers tend to cover anywhere from 25 to 75 miles (40 – 120 km) in a given day as the riding can be technical. Injuries are a given factor when mountain biking, especially in the more extreme disciplines such as downhill biking. Injuries range from minor wounds, such as cuts and abrasions from falls on gravel or other surfaces, to major injuries such as broken bones, head or spinal injuries resulting from impacts with rocks, trees or the terrain being ridden on. Another risk factor is that mountain biking takes places in wilderness area so emergency response will be delayed in case of injury. Protective equipment can protect against minor injuries and reduce the extent or seriousness of major impacts, but may not protect a rider from major impacts or accidents. To reduce the risk of injury, a rider must also take steps to minimize the risk of accidents, and thus the potential for injury; by choosing trails which fall within the range of their experience level, ensuring that they are fit enough to deal with the trail they have chosen, and keeping their bike in top mechanical condition. If a mountain biker wishes to explore more dangerous trails or disciplines, such as downhill riding, they must learn new skills, such as jumping and avoiding obstacles. Where a rider lacks the fitness required to ride a particular class of trail, they may become fatigued, putting themselves at an increased risk of having an accident. Lastly, maintenance of the rider's bike needs to be carried out more frequently for mountain biking than for casual commuter biking. Mountain biking places higher demands on every part of the bike. Jumps and impacts can crack the frame or damage components or the tire rims, and steep, fast descents can quickly wear out brake pads. Since the widespread adoption of hydraulic and mechanical disk brakes on most mountain bikes from the late 1990's, the issues of brake pad wear, misalignment with, or slippage of rim brake pads on rims designed for rim brakes or "V brakes", has become a non issue. Thus, whereas a casual rider may only check over and maintain their bike every few months,a mountain biker should check and properly maintain the bike before and after every ride. Mountain bikers have faced land access issues from the beginnings of the sport. Some areas where the first mountain bikers have ridden have faced extreme restrictions or elimination of riding. Opposition to the sport has led to the development of local, regional, and international mountain bike groups. The different groups that formed generally work to create new trails, maintain existing trails, and help existing trails that may have issues. Groups work with private and public entities from the individual landowner to city parks departments, on up through the state level at the DNR, and into the federal level. Different groups will work individually or together to achieve results. Advocacy organizations work through numerous methods such as education, trail work days, and trail patrols. Examples of the education an advocacy group can provide include: Educate local bicycle riders, property managers, and other user groups on the proper development of trails, and on the International Mountain Bicycling Association's (IMBA), "Rules of the Trail." Examples of trail work days can include: Flagging, cutting, and signing a new trail, or removing downed trees after a storm. A trail patrol is a bike rider who has had some training to help assist other (including non-cyclists) trail users. The IMBA is a non-profit advocacy group whose mission is to create, enhance and preserve trail opportunities for mountain bikers worldwide. IMBA serves as an umbrella organization for mountain biking advocacy worldwide, and represents more than 700 affiliated mountain biking groups. The group was originally formed to fight widespread trail closures. In 1988, five California mountain bike clubs linked to form IMBA. The founding clubs were: Concerned Off Road Bicyclists Association, Bicycle Trails Council East Bay, Bicycle Trails Council Marin, Sacramento Rough Riders, and Responsible Organized Mountain. A critical literature review by Jason Lathrop on the ecological impact of mountain biking notes that while recreational trail use in general is well studied, few studies explore the specific impact of mountain biking. 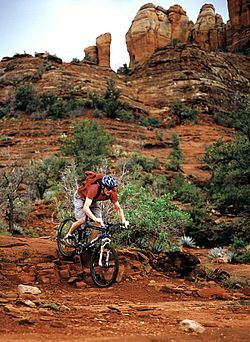 He quotes the Bureau of Land Management: "An estimated 13.5 million mountain bicyclists visit public lands each year to enjoy the variety of trails. What was once a low use activity that was easy to manage has become more complex". The environmental impacts of mountain biking can be greatly reduced by not riding on wet or sensitive trails, keeping speeds modest so as to minimize cornering forces and braking forces, not skidding, and by staying on the trail. Mountain biking has been demonstrated to act as a human-mediated form of seed dispersal. Due to advancements in technology mountain bikers have begun to move onto trail networks once only accessible by hikers. The nature of their movement patterns also plays an important role as a vector for seed dispersal. Mountain bikes are not bound to any specific type of infrastructure and can therefore move freely between ecological environments acting as a connecting dispersal vector between habitats. Combined with their relatively long range and speeds they also contribute to long-range dispersal. 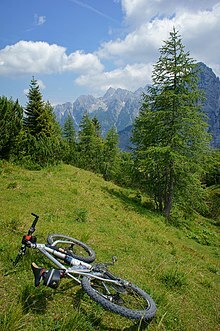 In an effort to understand and assess the socio-ecological consequences of mountain bikes as a vector for seed dispersal Fabio Weiss, Tyler J. Brummer, and Gesine Pufal conducted an environmental impact study on forest trails in Freiburg, Germany. The results of the study found that although the majority of seeds detached from tires within the first 5–20 meters; small portions of seeds were still present after 200–500 meters contributing to moderate dispersal. The potential for long-distance dispersal was found through the transport of seeds on areas of the bike that did not come into frequent contact with the ground. The study also found that the majority of participants only cleaned their bikes on average every 70 km or every two rides. Rides executed in two different areas have the potential to connect previously unconnected habitats creating the potential for unwanted plant invasions. a)	Clean the bike between rides in different habitats, before traveling and especially before entering sensitive natural areas and regions. b)	Control weeds and non-native species at trailheads and trail margins. c)	Educate mountain bike riders about the potential dispersal of different species (good stewardship begets riding privileges). d)	Encourage cooperation between mountain bikers and managing authorities (avoid condescending regulations, establishment of monitored designated riding areas). 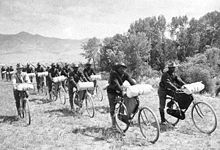 ^ "1896: African American Buffalo Soldiers test bikes for Army on 1,900 mile expedition". Retrieved 2015-02-24. ^ "End of road for Swiss army bike". Retrieved 2015-03-26. ^ Steve Griffith. "Off Road Origins". Rough Stuff Fellowship. Archived from the original on 2010-07-21. Retrieved 2010-06-18. ^ "The Chemeketan". 38 #9. September 1966: 4. ^ The Birth of Dirt, 2nd Edition. Cycle Publishing/Van der Plas Publications. January 1, 2008. ISBN 978-1-892495-61-7. Retrieved May 29, 2017. ^ Rogers, Seb (23 October 2010). "Interview: Specialized founder Mike Sinyard". BikeRadar. Retrieved 2 December 2010. ^ Brink, Tim (2007). Complete Mountain Biking Manual. London: New HollandPublishers. pp. 40–61. ISBN 978-1845372941. ^ Kloss, F.R; Tuli, T; Haechl, O; Gassner, R (2006). "Trauma injuries sustained by cyclists". Trauma. 8, 2: 83 – via Scopus. ^ Sharma, Vinay K.; Rango, Juan; Connaughton, Alexander J.; Lombardo, Daniel J.; Sabesan, Vani J. (2015). "The Current State of Head and Neck Injuries in Extreme Sports". Orthopedic Journal of Sports Medicine. 3 (1). ^ Adventure and Extreme Sports Injuries: Epidemiology, Treatment, Rehabilitation and Prevention. By Omer Mei-Dan, Michael Carmont, Ed. Springer-Verlag, London, 2013. ^ Ten Things You Might Think You Need for a Long Distance Tour, but Don't. Blog of Adventure Cycling Association, April 10, 2012. ^ a b "How to Get Started Bikepacking". REI. Retrieved 2018-03-22. ^ "What's the difference between cycle touring and bikepacking? | Cycling UK". www.cyclinguk.org. Retrieved 2018-03-22. ^ "Bikepacking 101 - BIKEPACKING.com". BIKEPACKING.com. Retrieved 2018-03-22. ^ "What Is A Bikepacking Bike? Is It Different To A Standard Bike? - CyclingAbout". CyclingAbout. 2017-06-05. Retrieved 2018-03-22. ^ "Bikepacking Basics - Everything You Need To Start Bikepacking". bicycletouringpro.com. Retrieved 2018-03-22. ^ Kronisch, R.L. ; Pfeiffer, R.P. (2002). "Mountain biking injuries: An update". Sports Medicine. 32, 8 (8): 523–537. doi:10.2165/00007256-200232080-00004. PMID 12076178 – via Scopus. ^ Carmont, M.R. (2008). "Mountain biking injuries: A review". British Medical Bulletin. 85, 1: 101–112. doi:10.1093/bmb/ldn009. PMID 18296453 – via Scopus. ^ Marion, Jeff; Wimpey, Jeremy (2007). "Environmental Impacts of Mountain Biking: Science Review and Best Practices". International Mountain Bicycling Association. Retrieved 12 August 2015. ^ Pickering, Catherine Marina; Hill, Wendy; Newsome, David; Leung, Yu-Fai (2010). "Comparing hiking, mountain biking and horse riding impacts on vegetation and soils in Australia and the United States of America". Journal of Environmental Management. 91 (3): 551–562. doi:10.1016/j.jenvman.2009.09.025. PMID 19864052. ^ "A Comparative Study of Impacts to Mountain Bike Trails in Five Common Ecological Regions of the Southwestern U.S." Retrieved 2015-02-27. ^ "Assessing and Understanding Trail Degradation: Results from Big South Fork National River and Recreational Area" (PDF). Retrieved 2015-02-27. ^ "Wildlife Responses to Recreation and Associated Visitor Perceptions" (PDF). Retrieved 2015-02-27. ^ Papouchis, Christopher M.; Singer, Francis J.; Sloan, William B. (2001). "Responses of desert bighorn sheep to increased human recreation". The Journal of Wildlife Management. 65 (3): 573–582. doi:10.2307/3803110. JSTOR 3803110. ^ Lathrop, Jason. "Ecological Impacts of Mountain Biking: A Critical Literature Review". Wildlands CPR. Archived from the original on 12 October 2007. Retrieved 12 August 2015. ^ "Minimum Impact Riding". International Mountain Bicycling Association. Retrieved 23 July 2017. ^ a b c Weiss, Fabio; Brummer, Tyler; Pufal, Gesine (2016). "Mountain bikes as seed dispersers and their potential socio-ecological consequences". Journal of Environmental Management. 181: 326–332. doi:10.1016/j.jenvman.2016.06.037. PMID 27379751. Retrieved 26 June 2018. This page was last edited on 15 April 2019, at 18:57 (UTC).